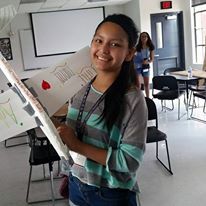 ACES (Applied Career Exploration in Science) Camp is a 4-day summer camp for 50 middle school girls each year, designed to expose them to a wide variety of careers, to provide a path to potential success, and to spark their interest in high education in the STEM fields. ACES stresses teamwork, use of technology, and hands-on learning, while giving our students a feel for the college experience at a critical time in their lives. 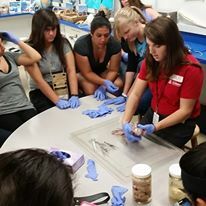 Applied Career Exploration Camp (ACES) for girls focuses on sparking interest in high education through teamwork activities and hands on learning. The camp is celebrating their 10th anniversary and more than 300 girls have attended the program. Some of the girls from the very first camps are now Raytheon engineers, scientists, and interns. One is even a co-coordinator of the camp now. ACES focuses on the importance of math, science and careers in technical sciences and stress that there are no longer any careers that are for men only.